Team USA Olympic medalists will be warm and stylish on the podium this year! 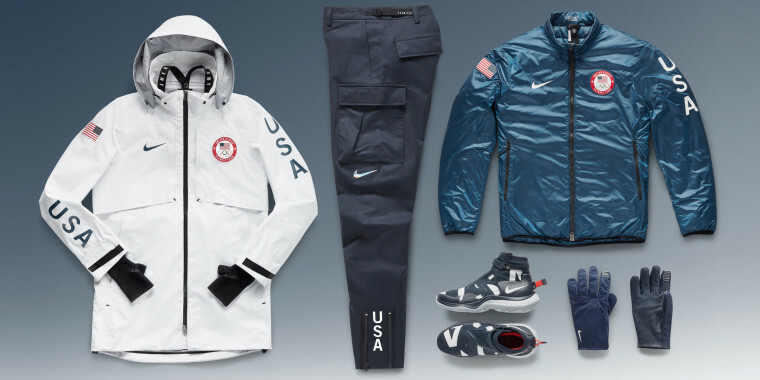 With just a month to go until the 2018 Winter Olympics kick off in PyeongChang, South Korea, Nike has revealed the official gear that American athletes will wear on the medal stand. Nearly all the medal ceremonies will take place in open-air arenas, with temperatures expected to dip below freezing, so athletes will definitely need to bundle up. With that in mind, Nike designed a super-insulated jacket for both male and female Olympians. The Team USA Hypershield Summit Jacket has a waterproof shell that blocks wind and rain, as well as built-in knitted hand warmers attached to the sleeve. The lightweight but warm coat also comes with a removable bomber jacket. Both the men’s and women’s pants have a DWR (durable water repellent) coating that will help athletes stay dry on the podium. They also have back pockets with snaps for carrying small items. Nike designed boots that can withstand very cold temperatures. Both the men’s and women’s boots have a lace-free closure. The women’s boots are slightly higher and feature built-in heat reflective material. Like the jacket and pants, the official Team USA gloves are layered with a waterproof material. The thumbs and forefingers are touch-screen compatible — handy for those inevitable gold medal selfies — and the gloves have a hidden zipper than makes them easy to pull on and off. And, of course, Team USA’s podium gear is printed with plenty of American flags and ‘USA’ lettering. The good news for all us non-Olympians? Nike’s Team USA Medal Stand Collection will be available to buy online and in select stores starting January 15.